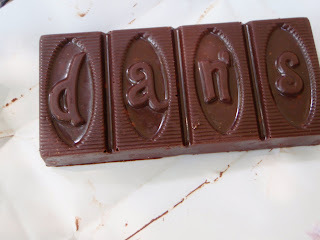 Yesterday while buying groceries at our local market I was lured over to the candy area by several boxes of a brand of chocolate I hadn’t seen before, called Dan’s Chocolates from a company in Burlington, VT. I am always a sucker for attractive packaging, and all the different colored little nuggets with their crinkled wrappers were incredibly enticing. I decided to try one of the truffles and settled on the PB Ecstasy, which boasted a 64% Cacao content. Generally I expect the peanut butter and chocolate combo to be a safe bet. Turns out, not always true. At first I was convinced that my so-called chocolate had been secretly switched with carob—it was over sweetened and had a strange texture. The peanut butter was dry, crumbly, and lacked peanut butter flavor. In short, neither myself nor Beta Wife could finish it. Now this is coming from someone who eats those big bags of discount milk choco/peanut butter eggs that have pastel foil. Orangadu - sweetness of the outer dark chocolate was balanced this time and also has the highest cocoa content, had a nice dark chocolate center flavored with orange. Very pleasant, good creamy center. White Chocolate Pretzel Truffle – not what I expected, but pretty good. Tastes a bit like a Zero bar. I was hoping for some pretzel chucks, but none showed up. If it gets a little warm the texture is a bit like Crisco icing. Peppy-R-Mint – this was my favorite, and the only bar chocolate that I tried. Good dark chocolate with little crunchy bits of peppermint candy. Tastes like Christmas. So I’m glad I gave Dan’s another try, and I even plan on going back to try more, except maybe not the one with raisins.